Hi Friends! I LOVE fancy fold cards! 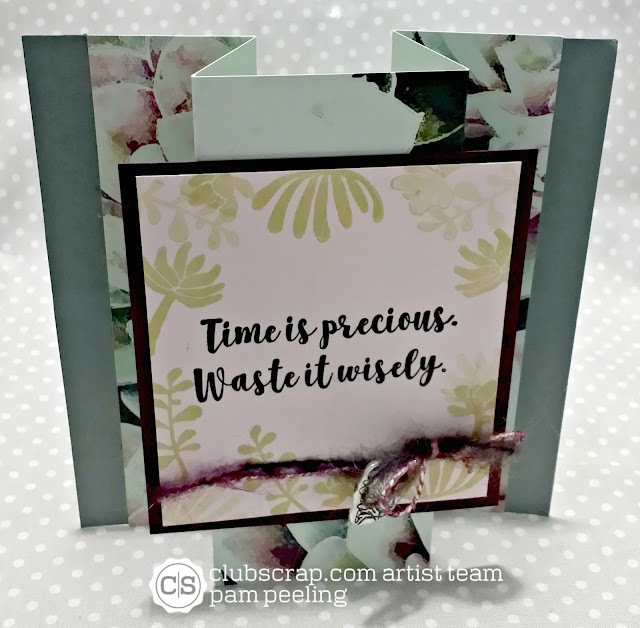 I'm so happy that Artist Team member Cheryl picked this as the Club Scrap technique challenge this month. So fun! 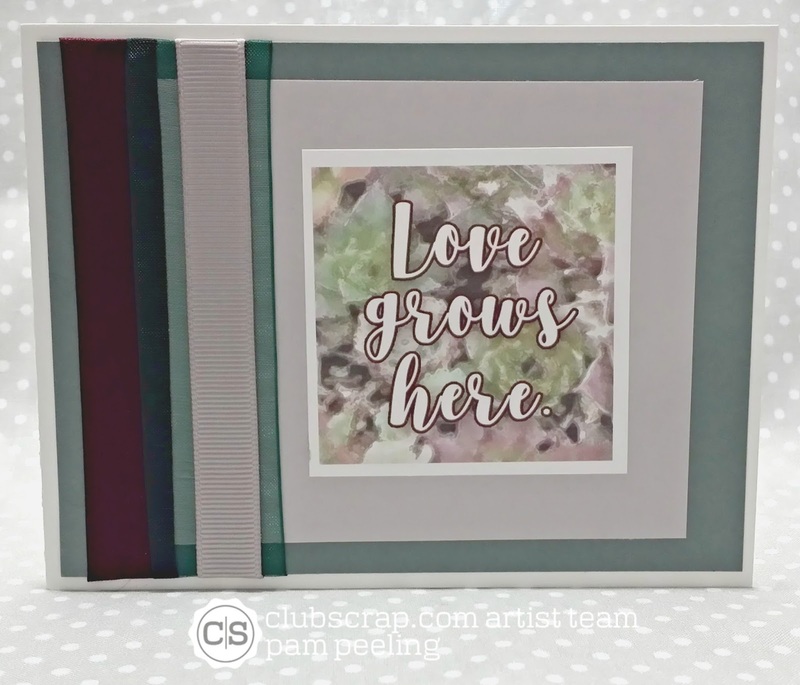 The Club Scrap February kit is called Succulents and it's full of beautiful colors and images of succulent plants!. The first card I made is a Gate Fold card. Yiu start with a standard 5 1/2" x 8 1/2" base but score it on the long side at 2 1/8" and 6 3/8". It folds and the ends meet in the middle. I used a panel from the embellishments cut a part page that came with the deluxe kit on the front. 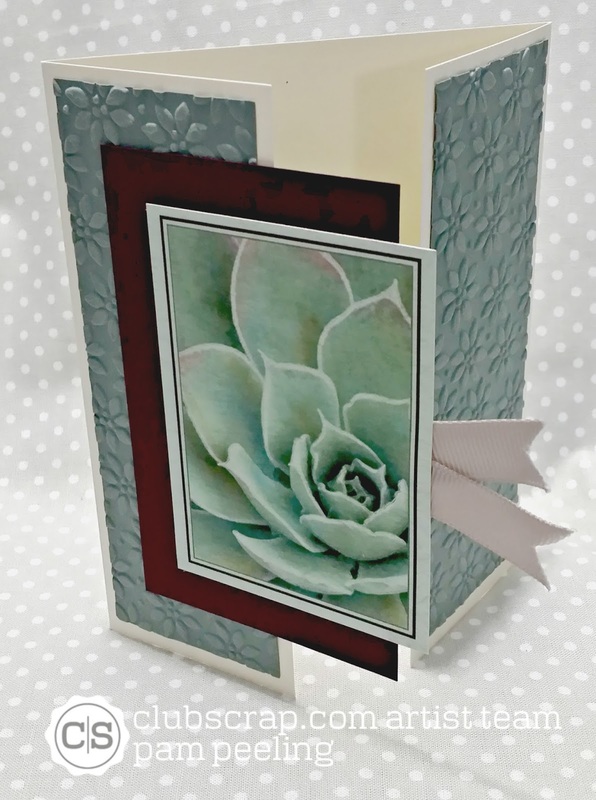 The embossing folder is actually a pointsetta design from Stampin up but I thought it could pass as a succulent! Then I made a Triple Panel Standing card. The base is a standard 5 1/2" x 8 1/2" scored on the long side at 2", 3 1/8",5 3/8" and 6 1/2". The front panel measures 3" x 3/12". I stamped around the edge with images from the unmounted rubber stamps from the kit. On the front of this next card I used a panel from the embellishments cut a part page and a bunch of the different fibers from the kit. This one is my favorite-it's a pop up card! The background page is stamped with different images from the unmounted rubber stamps in Stampin Up's Crumb Cake ink. All the little pots and plants are stamped images from this kit too. The base of this card is 4 1/4" x 11" folded in half. The inside "V" pop u part measures 1" x 12" and is scored at 3", 6" and 9". The 4 little mattes are 2 1/2" x 2 1/2". So fun! Make sure to link your fancy fold card to the blog too! What a great set of fancy fold cards, Jennifer! These are super fun folds, Pam. I've never seen the last one (well, maybe a variation of it). Thanks for playing along with the challenge and sharing these folds! Absolutely ❤️️LOVE the folds you chose to do, and your cards are gorgeous!!! I love this collection, and so glad you played along!!! Pam simply gorgeous work!! Love it all! Way to knock this challenge out of the park! Gorgeous!